My favorite time of year is Summer! 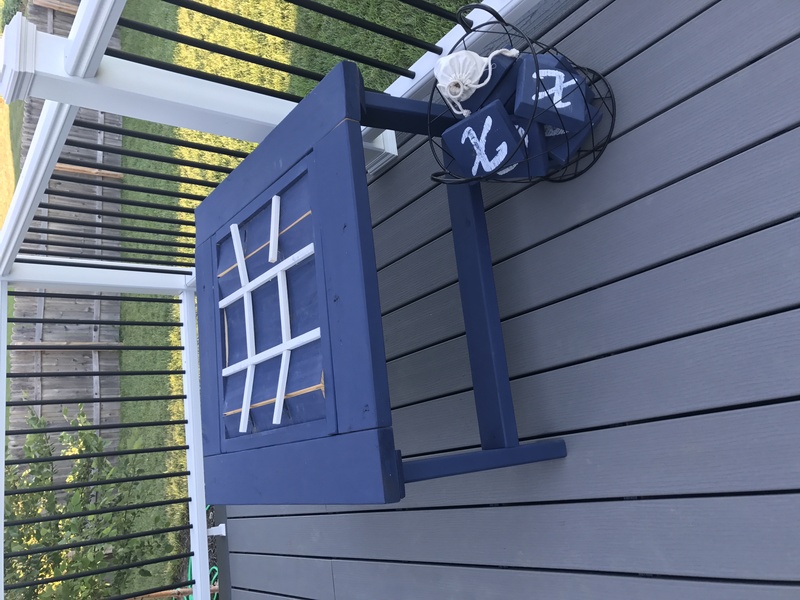 I love to spend time with my family outside and what better way to spend it than around a cute and fun game table! 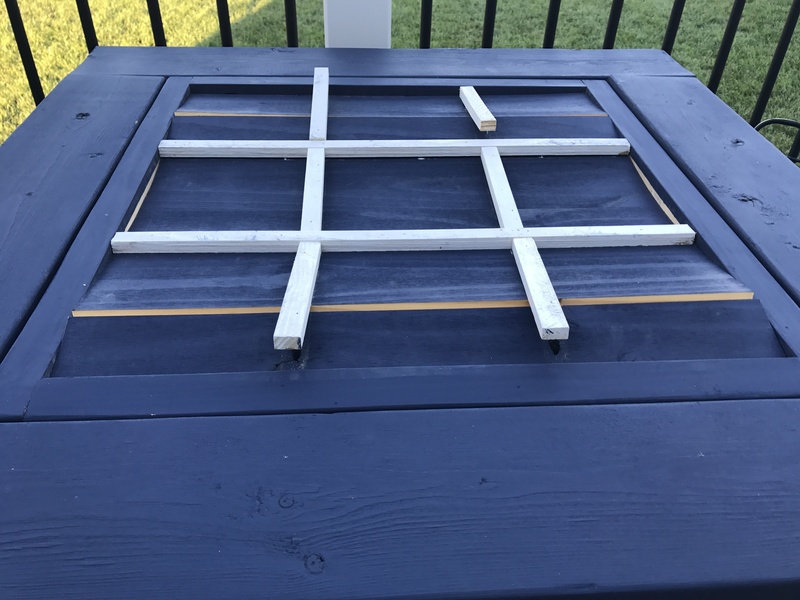 This DIY Outdoor Game Table top flips over and you have a choice of a tic-tac-toe game, checkers or chess! Don’t feel like playing a game? This table can double as an outdoor coffee table! It’s a super easy build, perfect weekend project AND it only cost me about $40 in lumber! Here’s how easy this guy is to build! Make the cut for the leg base assemblies. The legs will be miter cut at 10° on each end (parallel). To do this, lay the board flat, on it’s face, swing the miter arm to 10° and make the first cut. Slide the board down and make the second cut. The top pieces to the leg assemblies will be bevel cut at 45° on both ends (not parallel). To do this, you can use the miter arm (if you have a 12” saw). Lay the board, on the saw, with the face against the fence. Swing the miter arm to 45° and make your first cut. Then, slide the board down, swing the miter arm to the opposite, at 45°, and make your second cut. Drill 1 1/4” pocket holes in the tops of all 4 legs (note the pocket hole placement on the cut list). You can find our favorite Kreg Jig model HERE on Amazon! Here are the legs with the pocket holes. Attach a leg to the end of each top piece with 2 1/2” pocket hole screws and wood glue. Refer to plans for placement. Here is one leg assembly complete. Now, build the second one. Next, cut the supports and drill 1 1/4” pocket hole screws into each end. Attach them to the inside of each leg base with 2 1/2” pocket hole screws and wood glue. Now, attach the other leg base assembly to the supports with 2 1/2” pocket hole screws and wood glue. Cut the leg supports and drill 1 1/4” pocket holes into each end. Attach them 6” from the bottom of the legs with 2 1/2” pocket hole screws and wood glue. Note: The leg supports will sit square with the ground so, there will be a bit of overhang where they attach to the legs. Now, the table base is done and should look like this. Cut the top frame pieces and drill 1 1/4” pocket holes into the ends of the short frame boards. Attach the short pieces to the long boards with 2 1/2” pocket hole screws and wood glue. Flip the top frame upside down (pocket holes facing up) and set the leg base on top. The top frame should overhang the base 3/4” on the sides and the mitered ends of the base should be flush with the frame. Attach the base to the top frame with 2 1/2” deck screws and wood glue. Now, your table should look like this. I found THIS project panel from Home Depot. I only used 1/2″ of the panel so, I only included half of the cost of the panel in my budget. You can save the other half for another project! Cut the project panel to size. You can use your miter saw to do this. Just make a cut as long as you can down the panel then, flip the board over and cut the rest of the panel. Next, drill 3/4” pocket holes around every side (refer to plans for exact placement of the pocket holes). This will be the game board. Step 8 (Ryobi 19): Cut the game board frame pieces to fit around the game board. Drill 1 1/4” pocket holes in the ends of the short boards. Attach the short boards to the long boards with 2 1/2” pocket hole screws and wood glue. Attach the frame to the game board 1/2” from the top of the frame (pocket holes facing up on the game board). Attach with 1 1/4” pocket hole screws and wood glue. Cut the long trim pieces to size and attach them to the game board with wood glue and 1” brad nails. These trim pieces will act as the tic-tac-to game board and hide the pocket holes. Follow up with the shorter trim pieces. Measure and cut for these as you go. The middle pieces will be slightly longer than the others. Now it’s time to add the finish! I chose to spray paint my table with a Coastal Gray spray paint by Rust-oleum. You can find it HERE on Amazon. I spray painted the entire piece, first. Make sure to cut the tic-tac-toe blocks and paint them, as well! Then, I flipped the game board over to paint 32, 2 3/4”x2 3/4” squares to create a checker board. I drew my squares, with pencil, on the game board. Then, I tapped the design off with painters tape. Then, I used a paint brush to dry brush the black paint on the squares. I left the other squares the original grey paint color. The checker board should look like this now. I found these metal x’s and 0’s at Michael’s and spray painted them with Rust-oleum Satin Bronze spray paint. This is the prettiest gold spray paint! You can find it at Home Depot. Once everything was dry, I applied one coat of Rust-oleum Spar Varnish to the entire piece. Find it HERE on Amazon. Then, I attached the letters to the blocks with 1″ wood screws. I found this cute basket in the Spot section of Target. I found the checker pieces HERE on Amazon. 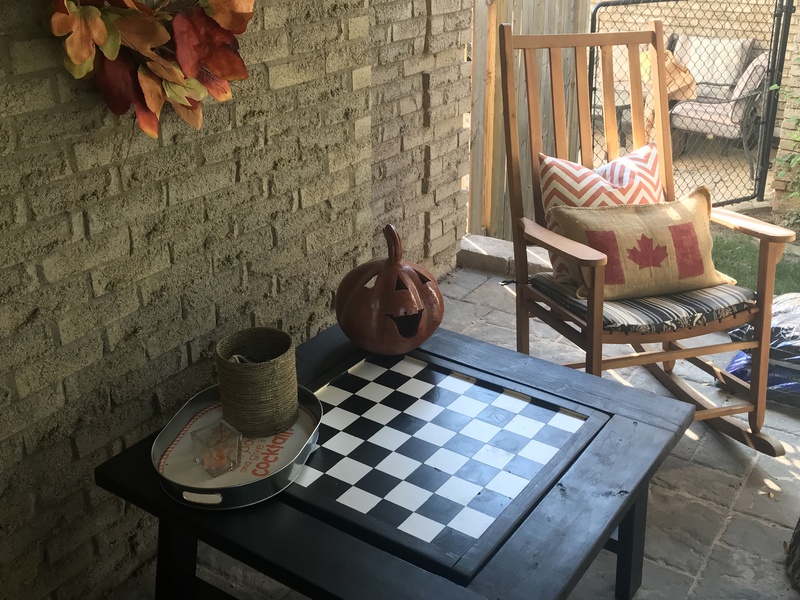 The outdoor pillows are from Target – HERE. And the Adirondack chairs are HERE on Amazon! https://uploads.disquscdn.com/images/7ddd95eb86d382bcf4a67b73caeca9a31a476c7469218ef2343506baaeaf22b6.jpg https://uploads.disquscdn.com/images/1b9e38486733ff2af81ce0fa1d7a47ccef2ef917886fbfd190c226abb6a0155f.jpg Am I the only one that had a problem with that panel from Home Depot warping? beautiful, creative and so fun nice work!